Offering you a complete choice of products which include hdpe pipe spacer. Owing to our expertise in this domain, we are indulged in offering a broad assortment of HDPE Pipe Spacer that is durable and gives maintenance free superior performance. This pipe spacer is designed to replace the two-piece base and intermediate spacer system, by combining the conventional base and intermediate spacer into a single unit. 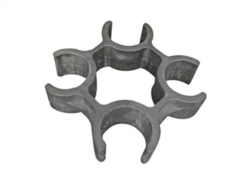 Leveraging our manufacturing strength we offer these pipe spacers in a variety of shapes, sizes and specifications as per the application requirements.